Mickey was bred by Patsy and Stephen Hollings, owners of the Gunalt Kennels in Leeds England, and became one of the foundation dogs for Jim and Karen Gibson's Zilverein line. 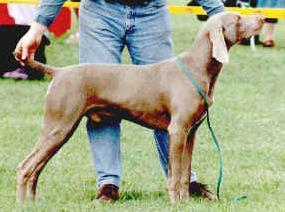 Mickey was the first weimaraner to simultaneously gain the titles of Champion under both Irish and English Kennel Club rules. Mickey was instrumental in raising the weimaraner profile in Ireland with his exceptional show career, the highlight being when he became the first weimaraner to win a gundog group at an all breed championship show held under IKC rules. Mickey also earned his Gundog Qualifying Certificate at the German Pointer Club of Ireland Field Trial.